TAMPA — Chris Godwin's alarm goes off at 5:50 most mornings, and by 6:20, he is already at One Buc Place. He's not the first player there, but the 22-year-old receiver's arrival, on many levels, is never in question. "The quarterbacks are always here, a couple of offensive linemen, but I would say under 10," Godwin said of his early-bird teammates. "It's less about a competition to be here first as it is me making sure I'm here with time to get into my routine." Godwin came to the Bucs as a third-round pick out of Penn State last year with a reputation as being mature, focused, detail-oriented. Establishing a routine is the framework for his emergence in his second NFL season: Longevity, he says, comes a single day at a time, through consistency. His day starts with a smart breakfast (egg whites, bagel, potatoes for carbs), stretching and rolling out, getting ready for the day ahead. "I'm trying to be here for a long time," Godwin said Wednesday on the second day of mandatory minicamp. "I believe if I come out here and be a professional, that's day in, day out, trying to be a model of consistency." Godwin had a quiet start to his NFL career, with just eight catches for 83 yards in his first eight games. He emerged in the second half, with 26 catches for 442 yards, hauling in his first career touchdown for a game-winning score on Jameis Winston's final throw of the 2017 season. That was Dec. 31 in a season-ending win against the Saints, and nothing pointed to the new year ahead with more excitement than Godwin. No player has drawn a steadier flow of praise from coaches throughout the offseason. 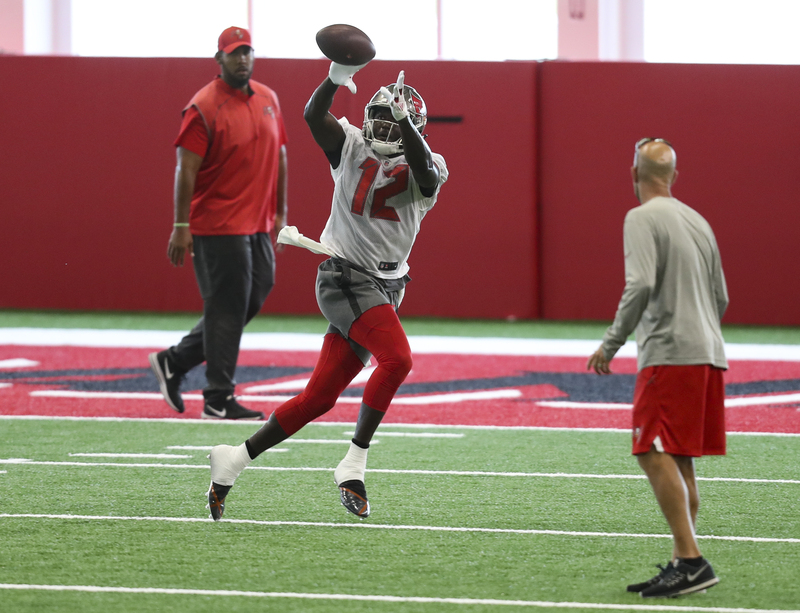 "If you were out here every day, you would have noticed Chris as one of the guys that, every day, made some kind of highlight play, on top of being very consistent," coach Dirk Koetter said Tuesday. One play in Tuesday's practice showed the new ease with which Godwin is carrying himself: He made a leaping touchdown catch on a throw from Winston in the back of the end zone, then just as naturally, lobbed the football up for teammate Mike Evans, who dunked it over the crossbar of the goal post. "Last year, I was just trying to find my way. Lay low, earn my stripes," Godwin said. "Just prove that I do belong. Once I proved it to myself, especially how the year ended for me, it felt like I belonged. Now I'm having fun. I'm doing what I love to do and blessed to be here." Godwin can't point to a singular moment where the game started clicking for him, though you could make a case for a 15-10 win against the Jets in Week 10, where he had five catches for 68 yards, stepping into a larger role when Mike Evans was suspended. "Everything was moving so fast, though not to the point where it was overwhelming," he said of his first two months. "Now, there are times where I realize I don't need to be going 100 miles an hour. I can settle down, relax and just be in my spot." The sustained buzz around Godwin challenges Koetter and his coaches to find more balls for another emerging and talented option in the passing game. Look at yards per target last season, and Evans (7.36) and DeSean Jackson (7.42) were well behind Godwin, who averaged 9.54. Don't forget second-year tight end O.J. Howard, who was even higher as a rookie at 11.07. "I just look at it as being better than I was the year before," Godwin said. "I would love to have a lot better numbers than I had last year, just a result of me playing more. I don't want to have that success with sacrificing my technique, doing the little things I did right. The things I did well, I have to improve on them and produce."